Some years ago my attention in a bookstore was caught be Jeffrey Sachs' book titled "The End of Poverty". Later at the UN I even had the chance to meet Jeffrey Sachs and his intelligence and passion are amazing. Doesn't ending poverty sound like a cause worth fighting for? It certainly does, the real question is how to achieve this. Other passionate and intelligent people, such as William Easterly, strongly disagree with Sachs' grand UN-plan. Millennium Development Goal 8 "Develop a global partnership for development " goes into the right direction Easterly has a point. He argues that one big plan for so many different cultures and countries have never worked and in fact have done damage. In fact when you study international development there are no clear examples where 'aid' actually really helped a country to develop. In Mali I even have found cases where aid reinforced dependency and created a corrupt aid system. Energy follows attention, this means that by focussing on poverty and pitying the 'poor' Africans (for example) and trying to 'help' them, it is actually contributed to reinforce the situation. The more we try to fix poverty the more energy it gets... why not talking about potential and sustainable prosperity? I have blogged many times about examples how CSR and especially Social Entrepreneurship can contribute to sustainable prosperity, rather ending poverty. These concepts tap into potential, they unleashing entrepreneurship and responsible business pratcices by an increased awareness that there is 'more' than profit or poverty only. For example, I am sure Yunus is not running around in Bangladesh pitying 'the poor' but has been their potential and unleashed it with microcredits. Fundamental problems such as poverty can not be solved until a shift in awareness helps our consciousness to go beyond the we-versus-them paradigm. We need to see the bigger picture, i.e. that we are all connected and therefore part of one whole (call it the planet, the universe etc.). Peter Senge, Otto Scharmer et. al., leaders in organizational learning, describe this well in their book Presence (more on this in a separate article). Finally, there are certainly enough resources on earth to happily feed the planet's population. Why do 20% of the world population need 80% of the world's resources? So it's not about ending poverty but about sustainable prosperity for all. How can it be achieved? With real partnership with 'aspiring countries', it's about fair trade (hallo Doha round), it's about sharing and collaboration, it's about expanding consciousness. So let's give energy towards sustainable prosperity which will end poverty along the way. 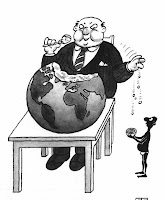 As Ghandi put it: "The earth has enough for man’s need but not for man’s greed"